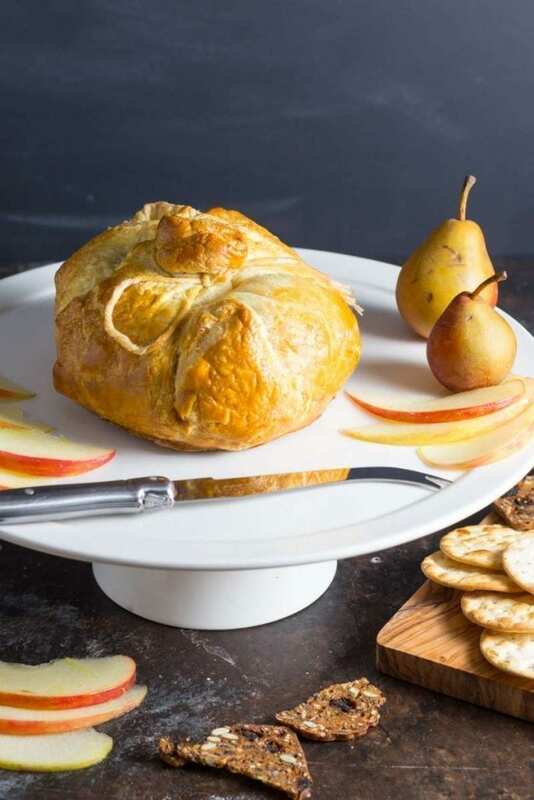 Baked Brie en Croûte with Spiced Apple and Pear Compote; A warm, gooey wheel of brie or camembert cheese, layered with homemade spiced apple and pear compote and wrapped in golden brown, flaky puff pastry. 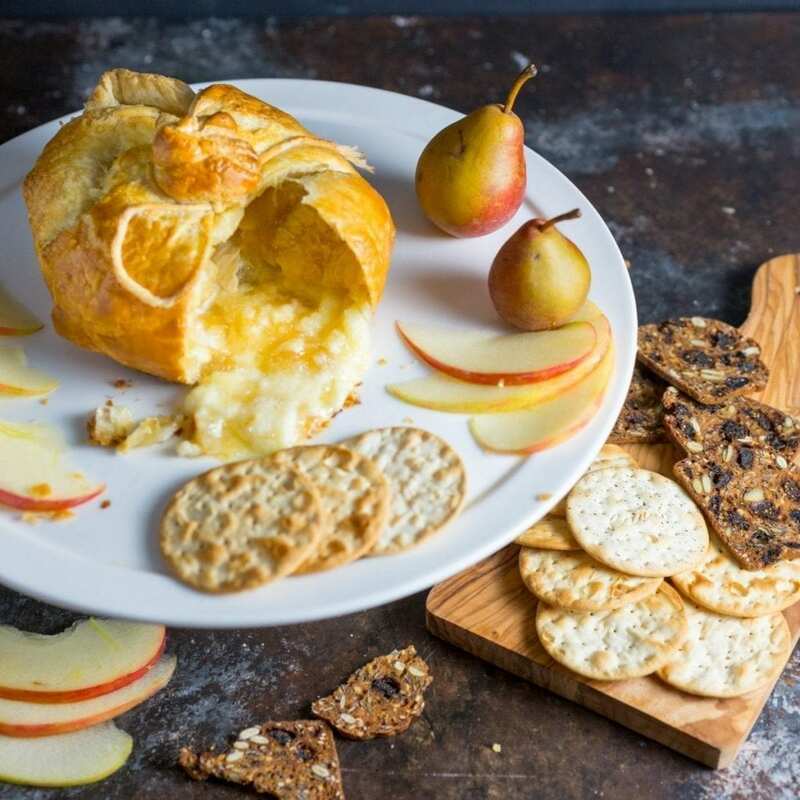 Offering maximum impact with minimal effort, a baked Brie turns a mild-mannered cheese into the superhero of a gathering: a warm, gooey communal comfort food. This version wraps the cheese in a shell of flaky puff pastry, along with two sweet-tart layers of apple-pear compote. Baking Brie in a puff pastry shell adds another level of deliciousness, without a lot of extra effort. Making your own apple and pear compote is easy, and it has a lot more flavor than most store-bought versions. Keeping the dough chilled beforehand ensures maximum puff when baked. Preheat a medium saucepan over medium heat, add butter, and swirl until melted. Add apple and pear and cook, stirring occasionally, until fruit is tender and has released most of its liquid, 5 to 7 minutes. Stir in sugar, cinnamon stick or ground cinnamon, ginger, and cardamom and cook, stirring occasionally, until most of the liquid has evaporated, 12 to 15 minutes longer. Discard cinnamon stick, if used. Remove from heat and let compote cool to room temperature. Using a sharp knife, cut cheese in half horizontally (through the middle). Lay one half on a work surface, cut side up, and spread 3 tablespoons (45ml) of compote evenly over it. Place second half on top and spread another 3 tablespoons (45ml) compote over it. Set prepared cheese wheel on prepared baking sheet. Brush dough evenly with egg wash. Bake until pastry is crisp and golden brown all over, 25 to 35 minutes. Let rest 5 minutes, then transfer to a platter. Serve any remaining compote alongside.